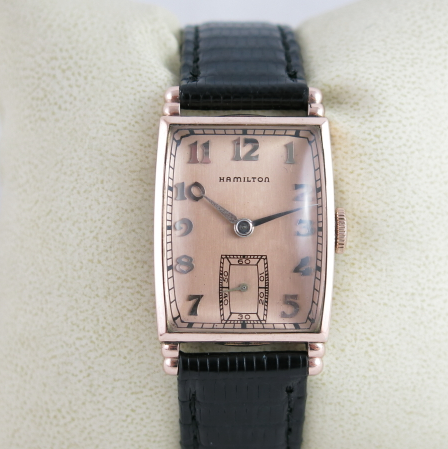 In 1941 Hamilton introduced models in "Coral Gold", aka rose gold. Some were in solid coral gold and others in coral gold filled. These models were also available in yellow gold cases too. The coral gold versions were only produced for one year and were interrupted by WWII. After the war, the coral gold options were not reintroduced - so they're all fairly unique collectibles. One of these special models was the 1941 Myron. The yellow gold filled model was produced through 1951 - although the coral gold version is much more scarce. Presented in a 10K gold filled case, the Myron featured Hamilton's 17 jewel, 14/0 sized 980 movement. The case is prone to wear through on the tips of the rounded lugs but examples in very good condition are pretty easy to come by. The dial is sterling silver and either finished in a two-tone butler / white finish or the pink coral finish. 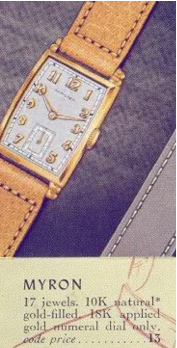 The yellow-cased Myron has solid 18K yellow gold numerals on the dial. The coral gold-cased models also have solid gold numerals but they are rhodium plated to look like white gold. I recently picked up a coral gold Myron - it was in excellent shape though it looked a little funny with very thick, curved crystal that gives the watch a gold fish bowl effect. It's so thick that I think it actually protected the case from excessive wear. I've restored a number of Myrons over my experience collecting Hamiltons. 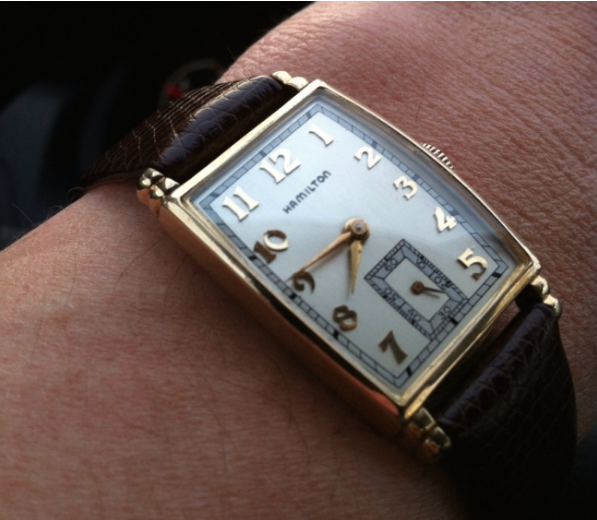 The Myron is a good sized watch for a model from this period. The 14/0 movement is compact enough to outfit some very small men's watches. Even though the Myron is small by today's standards, it's a large watch compared to it's peers. Here's an example of a yellow-cased Myron I restored a while back. The before shot shows you the typical wear pattern to the lugs. And as you can see, the dial was a complete disaster and needed to be redone. The watch had nice hands though - so it had that going for it. The after-shot with a fresh redial, new glass crystal and polished case shows what a little TLC can do for a vintage watch. Definitely a keeper! 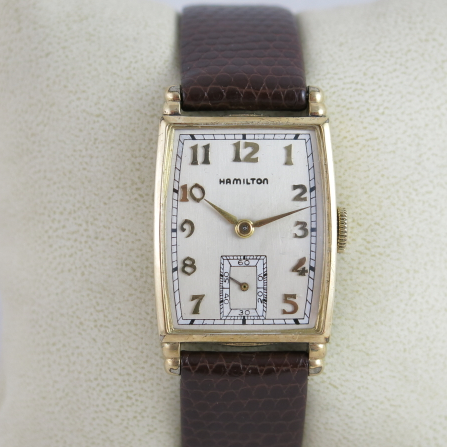 I am new to vintage watches and a Hamilton Myron is my first piece. It does need a new crystal. Can you tell me what the part number is and where to buy one? Email me (the link is above my photo) and I'll give you some options. Hello, I stumbled through here on my own watchmaking journey. I couldn't find the link you mentioned so wanted to touch base on where you got your crystal and maybe restoration done. I know of several outfits but am truly curious which one was used here. Many thanks! You can contact me through my Etsy shop or by clicking where it says "clicking here" above my photo in the upper right. Crystals are fairly easy to find by contacting any of the myriad sellers on Ebay. I get the vast majority of my dials redone by International Dial Co. They do a nice job and will correct things if they need to. There are other refinishers out there though. 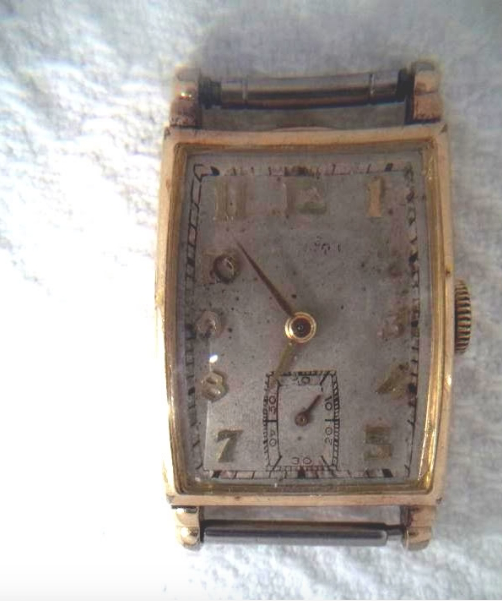 does anyone have information or a link where I can find info regarding the mechanical servicing & restoration of a 1941 Coral Gold Myron? Any competent watchmaker can handle a Myron. Contact me through Etsy or email and I'll give you a couple referrals. Mr. HandyDan, much apologies for NOT replying that much sooner! Being that it's a watch from the 1940's I truly didn't expect a valuable reply, but Ohhhh was I wrong! Yes, I simply didn't see your very gracious reply regarding referrals because I DO BELIEVE - since the inside of the back casing has numerous service annotations, along w/ their respective dates - I figures it wouldn't be that difficult to get the vintage beauty fully functional once again. Any info you may be able to provide will be greatly appreciated! 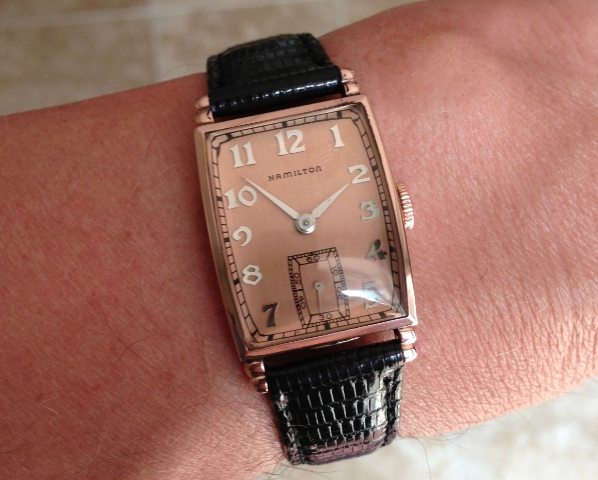 How much is 1941 coral gold myron watch worth? Depends on condition. A really nice one that’s recently serviced is a $300+ watch in my opinion.